This is hilarious. I don’t watch Parks and Recreaction, but I do eat bacon. And I love bacon. I also love funny videos, and funny poetry videos. Funny poetry videos about bacon are even funnier. Anyway, watch Nick Offerman’s “Slam Poem to Bacon” and see if you don’t want to go “slam” some bacon immediately afterward. 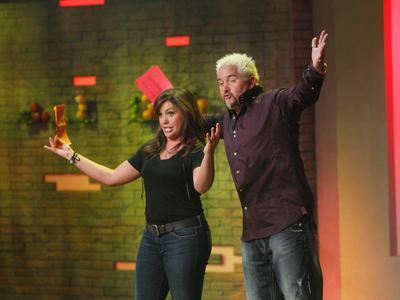 If you watched last year’s “Chopped All Stars” on Food Network, you know that it was riveting and must-see TV. I, for one, was thrilled to see some of the judges, who were generally very difficult to please and very hard on the contestants, have to compete and see what it was like on the other side. But even better, in addition to the “judges” round, there were three other rounds with themes–former contestants on “Food Network Star,” for instance, and then one final round featuring the four winners. Former “Next Iron Chef” contestant Nate Appleman won last year’s inaugural crown. I mean, seriously? The “Judge Remix” round is going to be awesome, but really, all of them are compelling themes. If you saw “Food Network Star” last year, you know that Penny Davidi is a great cook but also a drama queen who is sure to add to the ratings. And if you’re not familiar with “Chopped,” the show is hosted by Ted Allen, and the four contestants have 20 minutes to cook an appetizer using four items in a mystery basket, after which one contestant is “chopped,” or eliminated. Then the remaining three cook an entree in 30 minutes, and the two finalists have 20 minutes to make a dessert. The producers of the show, of course, find all kinds of weird ingredients and put items together that should never go together (for example–jelly beans, fish, purple carrots and potato chips). But that adds to the fun. 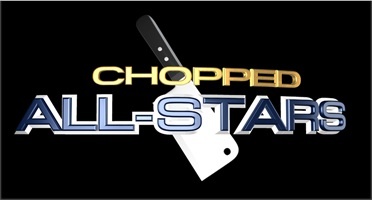 So there you have it–another great season of “Chopped All Stars” awaits next month. Will you be watching? Have you guys seen the new Rachael vs. Guy Celebrity Cook-Off show on Food Network? Well if you haven’t, let me fill you in and I guarantee you will watch–especially if you love watching celebs duke it out on reality shows. The show airs on Sunday nights, and last Sunday was the series premiere. And the premise is that Rachael and Guy, two of the Network’s more prominent stars of the past decade, head up teams of four celebrities in a cooking competition. As is the case with many of these type shows, we’re talking (my apologies to those competing) celebs that are kind of washed up, B-listers or C-listers (or at most high A-minus). We’re talking Taylor Dayne, Aaron Carter, Summer Sanders, Coolio, Cheech Marin, Lou Diamond Phillips, Alyssa Campanella, and Joey Fatone. Yikes. The first episode had them break into two teams, each coached by Rachael or Guy, and they had to cook for 300 guests at an outdoor BBQ party in New York City. The best cooks seem to be Phillips, Marin, Sanders, and Coolio. Dayne and Carter were the two worst cooks on the losing team, and had to face off in a 30 minute shrimp challenge to see who went home. The loser was Carter, who wound up in the bottom because of a horribly bland macaroni salad. Dayne was able to stick around, much to my chagrin, because while she was quite the star in the late ’80’s with gorgeous, flowing hair, she had some serious plastic surgery done and looks frighteningly like Michael Jackson. Anyway, do yourself a favor and check this show out….it’s funny and quite entertaining. As someone who is passionate about both food and music, finding someone else who resides near that same intersection is always fun. But it’s even more fun when that someone is someone like Jennie Kelley, who was one of the last remaining contestants on Season 2 of Fox’s hit reality show, “Masterchef.” Jennie is also a choral member of the 21-person symphonic group Polyphonic Spree, who released a holiday song, “It’s Christmas,” on their own Good Records Recordings label. We had the opportunity to chat with Jennie about–what else? Food and music. Mikey’s Kitchen: So how often do people make the connection between Jennie Kelley from the Spree and Jennie Kelley from “Masterchef,” and are you surprised either way? 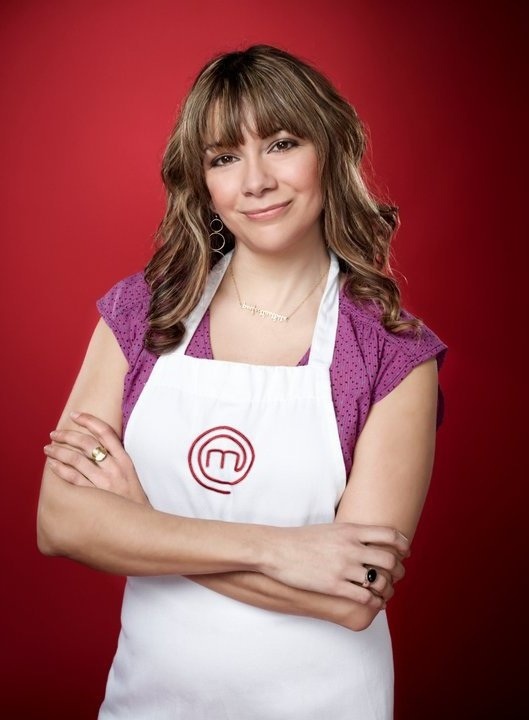 Jennie Kelley: More often than not, if I am recognized it’s for “MasterChef.” Not so much with the Spree. There’s a lovely level of anonymity that comes from being in a 20-person ensemble! Oh and yes, I’m always a little surprised when it happens because it’s usually when the show is the last thing on my mind. But it’s always cool… people usually want to know how much drama was really going on and if we stay in touch. Which, by the way, we do. We all have this food boot camp connection and a bond that’s unbreakable. MK: How has your life changed since the show, and what projects are you working on food-related? MK: Your favorite thing to cook, and your favorite thing for someone else to cook for you? JK: I am savory all the way. So I don’t really do a lot of sweets at home. My favorite thing to cook is always changing, but right now I’m really into homemade pastas and braised meat of any kind. My favorite thing for someone else to cook? Dessert, yep, definitely dessert. MK: Are any of the other members of the Spree foodies and if so, in what capacity? JK: For sure. Tim (DeLaughter) and Julie (Doyle) are definitely passionate about food and are great eaters/diners. They’re very open to trying what’s current and modern. Although, sometimes if Tim finds something he really loves, it’ll hinder him breaking out. We were in Sweden once and he got on a Swedish meatball kick. He couldn’t get enough of it and ordered it almost everywhere we went. Jenny Kirtland’s brother is a chef, so she’s pretty in-the-know and has a great palate. And they’ve all been incredibly encouraging of my culinary journey and more supportive than I can describe here. MK: Have you been to any of the restaurants of the “Masterchef” judges? JK: Yes, I’ve been to Osteria Mozza, Joe Bastianich’s place in Los Angeles. I’ve been there twice, actually, once when Joe was there. He’s an unbelievable host, has great front-of-house skills and you could tell he knew what was going on everywhere. The food there is killer. The other time the service wasn’t so great, but it was close to kitchen closing time. And even though there were some major service hiccups, the food was still stellar. I am also mad for Eataly in NYC. I was there for the first time last weekend and had two great dishes (lobster spaghetti and orecchiette with sausage and pesto). The entire space is a culinary dream. MK: Lastly, if you have holiday recipe to share or link to one, that would rock…..
JK: Yeah, I like to do a few appetizers… something for people to nibble on while the big meal is being made. You can prep them the night before and just pop them in the oven the next day. I’ve got a “devils on horseback” link here: (http://www.theperfectlastbite.com/2011/05/devils-on-horseback.html) or shortened here: (http://bit.ly/pVgpxB). The trick is the taleggio cheese-simply delicious. You can also use prosciutto instead of bacon to change it up a bit. 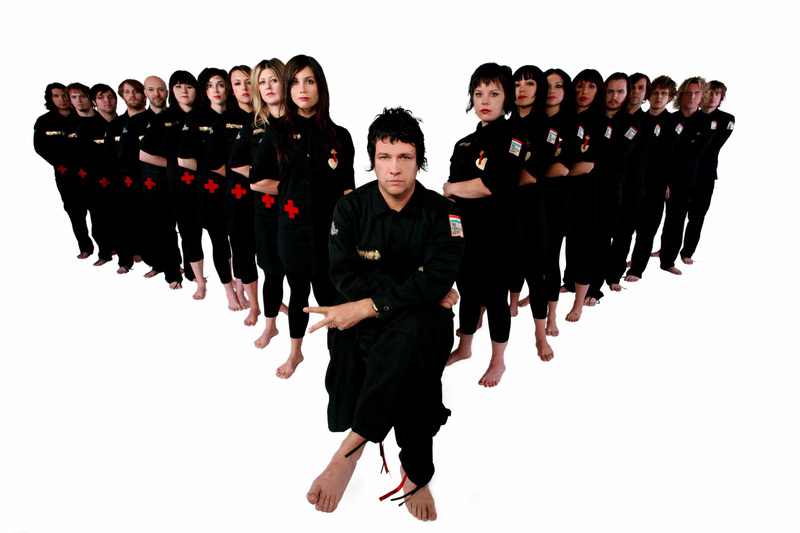 For more information about Polyphonic Spree, please visit here. My nephew turned me on to this site, and it’s freaking hilarious and scary at the same time. It’s Epic Meal Time. If you are a producer or trainer from “The Biggest Loser,” turn away please. If you are a veg-head, turn away please. If you are offended by someone making model cars with meat, turn away please. Wait, what? Model cards with meat? Yeah, I thought you’d like to see that. Check it out and if you think it’s as funny as I do, I will re-post more of their stuff…after all, I sure as hell don’t want to try this at home!